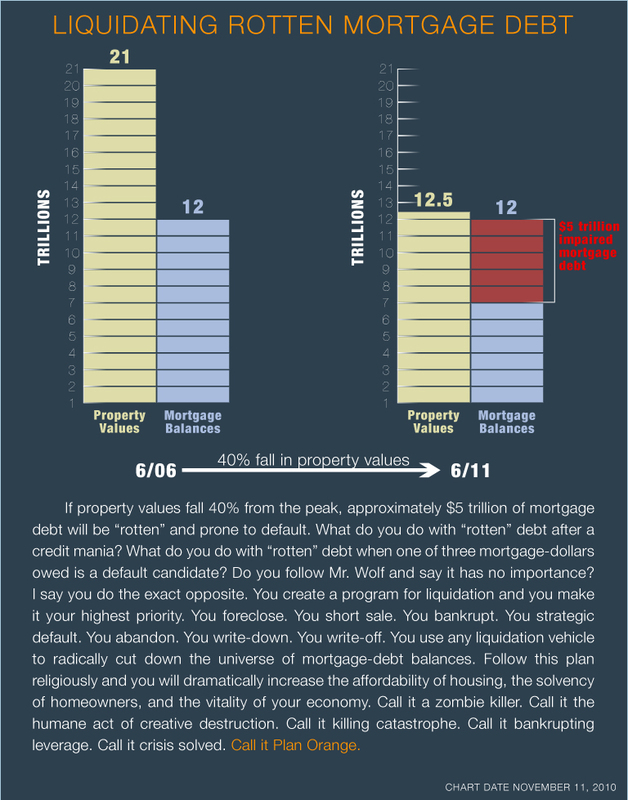 Yes, I agree, let’s unplug the programs artificially holding up inflated property values and creating a zombie market. However, some comments here go too far in blaming urban planning policies and regulations for the bubble. There must be a balance between the value of money for the sake of profits and growth, and the value of the environment and quality of life. Unbridled capitalism that worships the “wisdom of the market” uber alles breeds destruction as we’ve seen with the robber barrons of the late 1800s and deregulation during the Clinton and Bush years that contributed to the mess we’re currently in. Where would you rather live, San Luis Obispo California (drive thru businesses banned/wide sidewalks/high level of biking and living near work–all serve to increase social interaction), which a study recently named happiest community in the US OR Dallas or Houston (fine if you’re rich, as anyplace can be when tax supported services do not matter to you; not so good if you’re middle class and must rely on poor school systems, few social services, commuting long distances, traffic, pollution). Brought to it’s logical conclusion unbridled capitalism will destroy the planet. Capitalism must be tamed by smart policies that seek to balance entreprenuerial growth with protection of life. 1. Liquidation of assets in not new for the government, nor is government intervention into the real estate arena. When Tax Reform Act of 1986 was enacted severe limitations were placed on deductions for passive activity losses and limitations on passive activity credits were removed and many tax shelters. 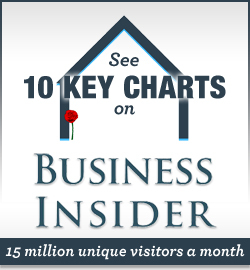 This significantly decreased the value for real estate investments. Most of these investments were held more for their tax-advantaged status than for their profitability. The holders of loss-generating properties tried to unload them and contributed further to the problem of sinking real estate values. The devaluation of real estate contributed to the end of the real estate boom of the early to mid ’80s and facilitated the Savings and Loan crisis. The governments answer was The Resolution Trust Corporation whose function was liquidation real estate and financial assets inherited from insolvent thrift institutions. Government intervention in the market is inherent in the both bubble events, however, the 1980’s bubble amounted to $160 billion loss verses the current bubble which could reach a magnitude in the Trillions of dollar range. 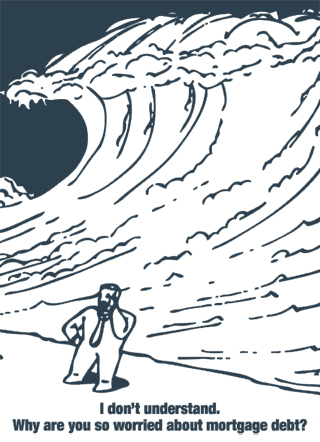 Without a systematic reduction of the “artificial” value produce by the current bubble our economy will collapse or in the best sceneries take several decades to recover. 2. As a self proclaimed rational real estate professional of over 40 years, I look to others for the answer this question. Great post & comments Michael. 1) Do you have an example from history of the successful national implementation of a liquidation plan such as you call for? 2) In the more likely event that our leaders continue to not follow your advice, what is a rational real estate professional to do? 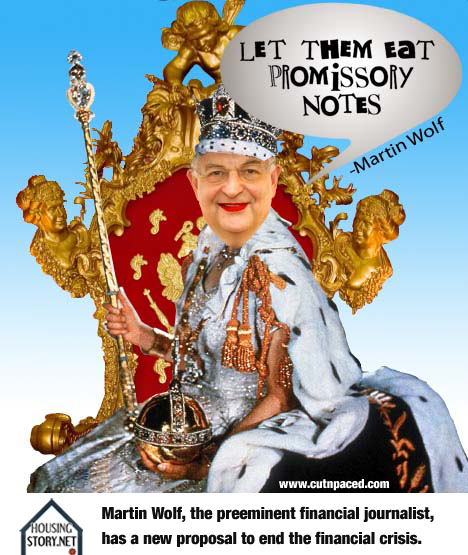 another fine peice of commentary, thank you Mr. White- a sane voice in the bizarro world of post 2008 financial crisis. personally, i would only change one word- replace the word “monopoly”, with the word “cartel” (in your description). 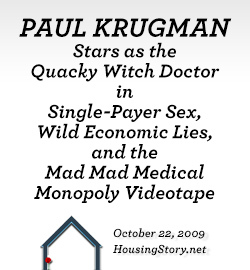 If the intent of the chosen few were the dismantling of capitalism and the creation of a new world order, the created housing bubble could not have performed a better slight of hand. 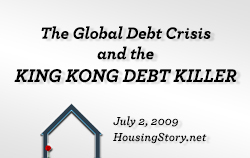 By demanding home ownership for all from the central government and basing your collapse on the “profit”/greed of investors the real estate bubble was a known result. Special and creative mortgage financing was accepted as an attempt to meet the demands of regulators and also took advantage of the short term “profit/greed” nature of individuals. The market dictates when there is a loser there is a corresponding winner. If you created this scheme you go long on the way up and short the market on the way down. Then take the profits and promote the demise of the system by collapsing the value of the dollar, gaining momentum for the new world order. Some people collapse currency and governments for their personal pleasure and control, learning from each collapse as they go. We need to recognize this treason and respond with an orderly dismantling of the intentionally created financial crisis. If we continue to allow the collapse our system, we will get the results they intended. A change needs to be made. 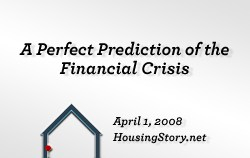 If all mortgage created in this period were to be “modified” to non-interest bearing notes with a 20 year payback period, we could dismantle this planned crisis in 8 to 10 years. This plan of lowering the monthly mortgage payments will have the effect of reducing the cost of real estate and revaluing real estate to historic levels over time. Sorry to keep saying the same thing over and over again; but Australia now has the world’s biggest housing bubble, and they did not have Fannie and Freddie. 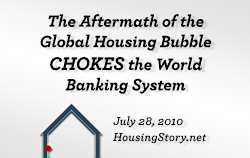 Neither did Spain or Ireland or Britain or France or any of the other dozen or so economies with housing bubbles as bad or worse than the “US” one. Ironically, the only significant places in the first world that escaped housing bubbles this time around, are in the USA; what is more, a majority of States in the USA did not participate in your housing bubble. You guys have the world’s BEST working examples of “how to avoid a housing bubble” right there, but you keep talking as if a few metros in California WERE the whole US housing market, along with Las vegas, Phoenix, and a few metros in Florida. You would be in a lot worse trouble if the whole US housing market WAS like you guys are imagining it is. 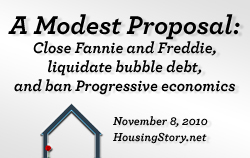 Maybe Fannie and Freddie are like “multipliers” of any bubble that gets underway. 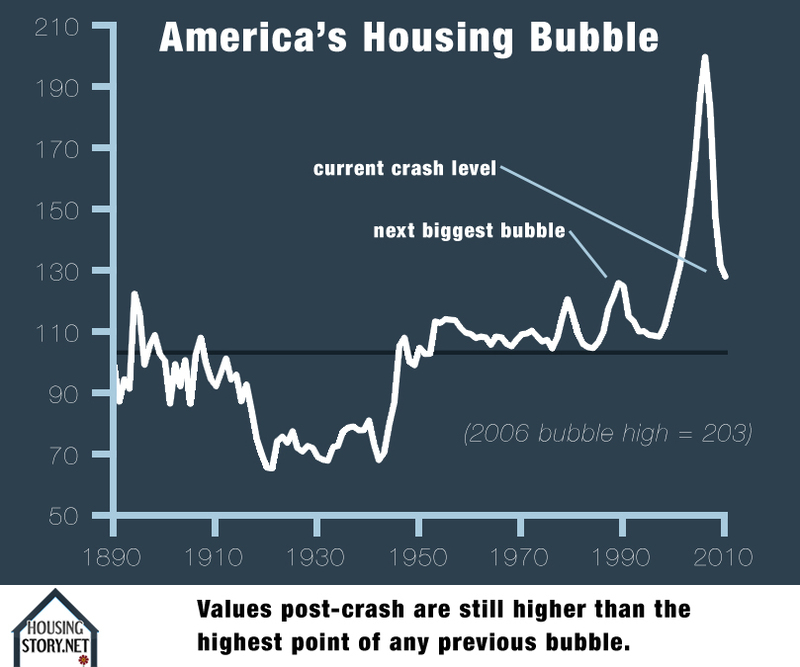 But bubbles ONLY get underway when local urban planners ration and delay the supply of new housing. It doesn’t matter if “supply” seems to be “adequate” by historical standards, the price of land still gets forced up by the tactics that become the norm in the development business. “Median multiples” don’t lie. The biggest “booms” never went past 4.5 before. THIS time, once they continued to rise indefinitely, speculative mania kicked in. Median multiples climbing through 5, 6, 7, 8, 9, 10, and 11 is just the height of hysteria. How many economists bothered about this? I share your contempt of economists, but for these extra reasons as well as the ones you give. I agree with everything you say about “liquidation”. I believe this should have happened right from the start. I do not believe a word of the “systemic risk” myth; bankers WILL “try their luck” with conceited politicians BEFORE they set about doing the HONEST thing. Had the USA’s founding fathers been governing today, they would have knocked a few heads together and got the bankers conducting the liquidation process pretty smartly. But I would add to what you say, BAN, at the Federal level, all urban growth regulations that force the price of land up. They are probably unconstitutional anyway. And there are more trillions of dollars to be liquidated in the economies of a dozen other countries yet. You Americans need to stop taking the sole blame for getting the global economy in trouble. The politicians in Europe just LOVE the chance to deflect attention from their OWN economic mismanagement and the gaping holes in their own housing and mortgage markets – which happen to be the result of the same internationally fashionable urban planning conceits. By the way, smart hedge fund operators made billions on “shorting” the mortgage markets SPECIFICALLY IN THE BUBBLE METROS. John Paulson, Steve Eisman, Michael Burry, Kyle Bass. Have you not read “The Big Short” by Michael Lewis? These guys worked out WHERE “the bubble” really was. 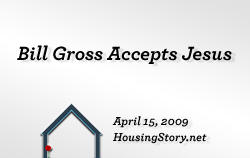 Alan Greenspan denied there was a “US housing bubble” precisely because, he said, there was only a few LOCALISED bubbles. The problem is, these FEW LOCALISED BUBBLES add up to the trillions of lost equity you are talking about. When some of the other nations bubbles blow up, considering that most of these nations had NO zones of affordable housing sanity at all, unlike the USA, ask yourself how big a mess THEIR economies are going to be in? The USA at least still has Texas propping it up. If you cut California out of the Union, you’d be the world’s strongest economy. Yes, everyone talks about Vegas and Phoenix as cities with “liberal” land use policies, when the reality is that the Federal Govt owns all the surrounding land and does not sell it. These places are proofs, not disproofs. You’ve certainly had a “national fall in prices”, but aggregate figures disguise the “90 – 10” nature of this. 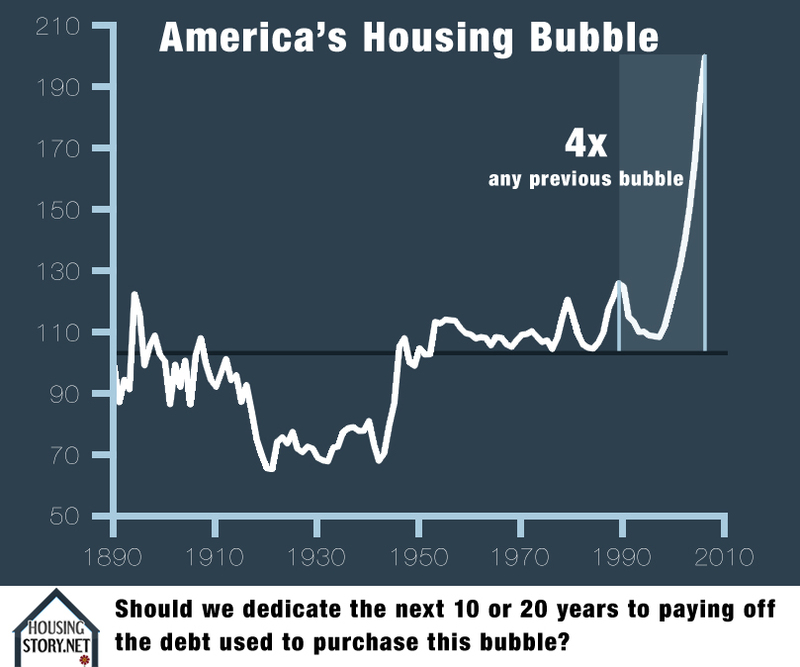 “America” would not have a housing bubble and house price falls if it were not for your bubble States. The non-bubble States price falls are small enough to allow them to be blamed on economic pressures EXTERNAL to those States. The USA actually has problems now similar, and worse in some ways, to the EU. The policies of California and Texas are as incompatible, or more so, within the same monetary and customs union, as those of Greece and Germany. The people of Texas and Germany are understandably both rebelling at the suggestion of having to keep bailing out the pampered lefty nanny state enviro wusses. Important writing. It really should be obvious to everyone. The people making decisions right now, and the people supporting their position, are all seriously compromised in some way. The contortions of logic that economists and other analysts must make to support the insane interventions they are undertaking, is frightening. My interest is in figuring out how these individuals are compromised. Sometimes it’s their legacy that they are trying to protect. Sometimes it’s ideological. Sometimes it’s political. And sometimes it’s just laziness and listening to the wrong people. 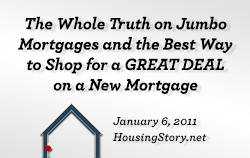 Everyone knows the free market works – more buyers at lower prices. 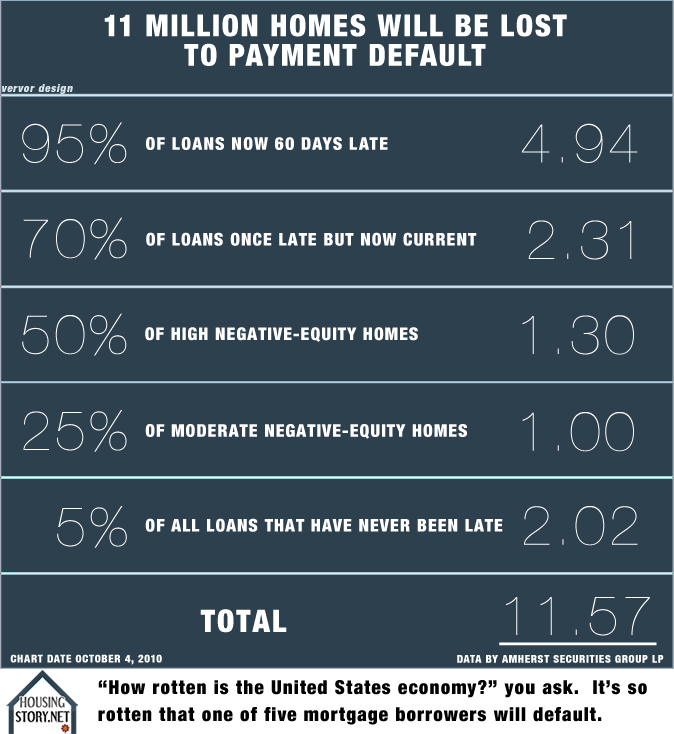 A sustainable market with lower prices is needed to bring private investors back into the mortgage debt market without a government guarantee. It seems so simple! Why don’t they get it? This is so simple. The government refuses to let the housing market return to sanity because it is protecting the bankers. If you let the debt be corrected as it should, it will take down the rich who pretend they own AAA debt that has no chance of being repaid. It’s a simple choice. Save the rich while the titanic goes down, or let the rich lose their money and go bankrupt on the unwinding of their false wealth created through fraudulent lending and leveraging practices. No one in power is willing to let their rich buddies go down. Hence the poor will continue to pay too much for housing which in turn will bring down the economy since they have no money left to spend on any thing else. The solution to our problems is lower housing costs. But for those in power who depend on the insanely false and unrealistic prices for their “wealth”, they would have to lose the majority of their fake money to save the country. They don’t care about the future…only their own survival. A bunch of children that need to grow up and do what’s right. I have an idea for some programs which will put all real estate back on its feet, increasing in value the way it did just a few years ago. First, we should lower interest rates. This will definitely get the market moving. But if we need to do more, there is more we could do. We could institute a tax credit of, say, $8000 for first-home buyers. Maybe we could include anyone who trades up for a home – they could get a tax credit, too. With these two simple steps, we can restore home values to the hyperbolic days of earlier this decade. But we don’t have to stop there. We can begin a program to adjust the mortgage balances of those people who just owe too much on their home, either because they bought more house than they could afford, or they lied on their loan application, or are just deadbeats who have decided to stop paying on their mortgage. We could call this program something catchy, like Helpful Adjustment of Mortgage Principal, or ‘HAMP’ for short. There you go. Anyone reading this can take these innovative and creative ideas to your local congressman to have them enacted into law. Maybe get the President behind it, he is supposed to be so bright, he will understand this in a wink. Then we will all be rolling in it again! When in your apparently correct scheme do the bankers and CPA’s who lied go to prison and their assets go to the public? When do the Govt overseers go to prison or at least get fired, loose their pensions? Nice article, an easy read. A great systematic approach. However I do not understand how replacement cost, or building cost effects these new very low housing prices. Home owners must insure the residence at a much higher value. Building materials have not come down that much and labor is still at the bubble highs for the most part. 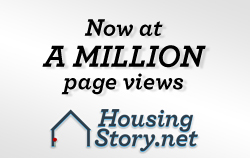 Can you comment on how building cost will effect future housing pricing?